Returns an independent copy of the renderer. Draw a single data item. Tests this instance for equality with an arbitrary object. Returns a token that controls how the renderer draws the end points. Returns a legend item for a series. Sets a token that controls how the renderer draws the end points, and sends a RendererChangeEvent to all registered listeners. Returns a token that controls how the renderer draws the end points. The default value is AreaRendererEndType.TAPER. The end type (never null). type - the end type (null not permitted). 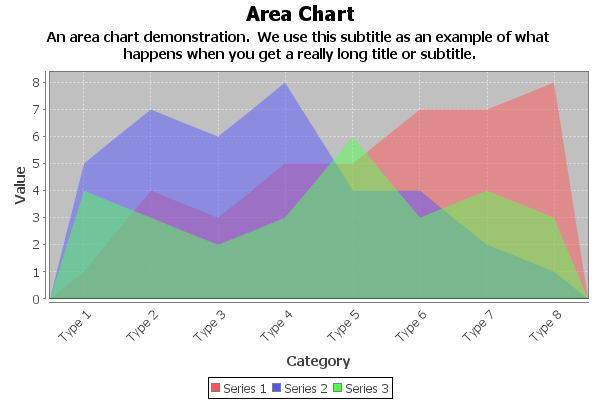 dataArea - the data plot area. obj - the object to test (null permitted). java.lang.CloneNotSupportedException - should not happen.